Our beloved CEO and the conceiving force behind CCSI is retiring. So we accept the facts but will give her a BIG retirement surprise party. She thought she could get away with just having a little get-together of the Little Productions board members but we went ahead and rented Versailles for the party and combined it with a trip to Paris. Here we are, flying off to Paris from the studios with the MFV. And here we are, arriving in Paris. Tomorrow and the day after you will see us sightseeing and having fun in Paris, and then we'll have the Retirement Party at Versailles - and you are all invited! So do come back for the next few days and participate in the fun, the more the merrier! 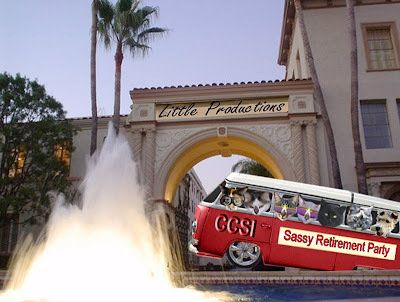 To leave a note of personal appreciation for all Sassy has done for the community with her fabulous creation of CCSI go here. 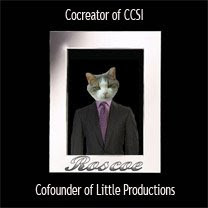 And don't despair - CCSI will go on, Opus has agreed to take over the CEO position and after the party we will have another announcement! 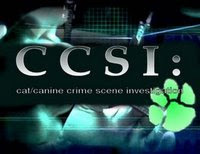 We look forward to many more adventures with CCSI. Roscoe and Sassy will always be with us, since we will never forget them! This is going to be quite an adventure. The gang always finds a reason to party and take an adventure! This one last hurah is going to be fun! 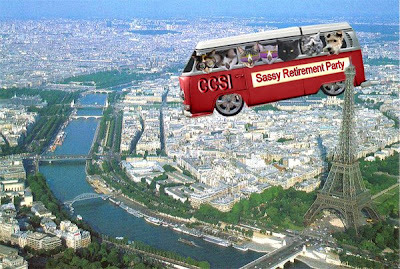 The CCSI gang might never be the same without Sassy, but neither will Paris once we are done with it! Let's try NOT to break the tower like we did the one in Italy! Wow! Did you all sure give me the biggest surprise. Just as I was ready to head out you all loaded me up in the MFV and off we headed. We never did know how to keep thing simple did we? Thanks to the gang, love all of you bunches and bunches!! Wow! Sassy sure is going out in style! Can't wait to see more...and the big party! I am sure that you will all have a wonderful time in Paris. This is going to be quite a party. Wooohoooo!!! Paris here we come. This tower looks a little more sturdy than the precarious one in Pisa. Perhaps it can withstand our onslaught. We'll see! What a great and wonderful retirement party! We are having such a great time on this adventure! This was SO great! In the MFV over Paris and see the Eiffel Tower from above. I was only wondering who was at the wheel here.... hahahaha.